On Saturday, Cassini flew within 9,500 kilometers of Mimas, the innermost of the medium-sized icy moons of Saturn. Here's a view taken late in the flyby as Cassini was receding, showing the moon and its emblematic crater Herschel. Look at Mimas' shape -- it's clear in this view that Mimas is fatter across the middle than from pole to pole. This color version was assembled by Adam Hurcewicz, who has just started posting his image processing work to unmannedspaceflight.com. It's great to see more and more people getting in to the fun of playing with space image data! This is Cassini's best encounter with Mimas to date, and it comes nearly six years into Cassini's mission. Why did it take Cassini so long to have a good flyby of Mimas? Icy satellite scientist Paul Schenk explained the reasons in his blog, which I'll paraphrase here. Mimas orbits close to the outer edge of Saturn's ring system -- its average orbital distance is about 186,000 kilometers, while the F and G rings are found at about 140,000 and 170,000 kilometers, respectively. In order to photograph Mimas up close, Cassini has to approach as close to Saturn as Mimas' orbit. For much of the mission, Cassini's orbit has not ventured as close to Saturn as Mimas; Cassini's orbit periapsis has been farther away from the planet. The biggest exception to this statement, interestingly, was the periapsis on "orbit 0," that is, Cassini's orbit insertion, when the spacecraft actually passed between the F and G rings. At other times, Cassini has had periapses around 160,000 kilometers, but I guess Mimas just wasn't in the neighborhood at the time. The science team didn't seem to see particular reason to expend precious fuel to set up a close flyby with a moon that looks like a battered rock that's been passively accepting the incessant banging of impactors without mustering much internal geologic activity, unlike its much more flamboyant neighbor, Enceladus. It would be a mistake to disregard Mimas as a cold cratered lump of ice, however. All of Saturn's other icy moons have betrayed some level of geologic activity in their past. The largest crater Herschel, about 130-140 kilometers across and 11-12 kilometers deep, is one of the deepest in the Solar System. 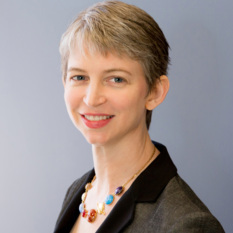 It may also be relatively young, providing an opportunity to study how craters on these icy worlds form and what they might tell us about the interior. Voyager mappers, myself included, saw sets of linear grooves that are most likely extension fractures crosing the globe. Whether these fractures formed when Mimas cooled and expanded or when Herschel knocked Mimas for a loop remains to be determined. Herschel was potentially large enough to have fractured Mimas throughout. Diminutive Mimas, named after a giant (!) of Greek mythology, is only 400 kilometers across. It is also distinctly non-spherical as its polar axis is 10% shorter than the longer equatorial axes. 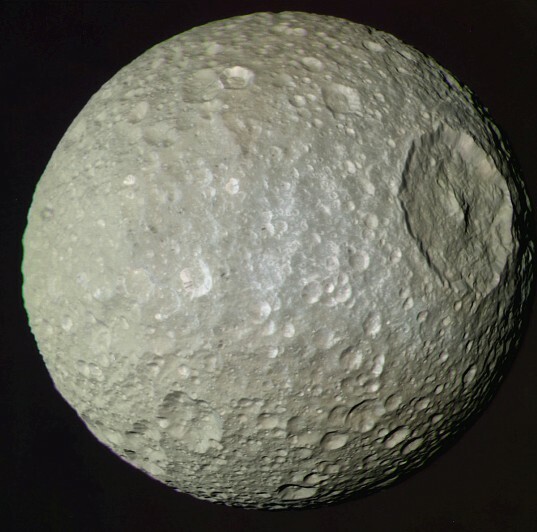 The degree of sphericity could be used to tell whether Mimas has a small rocky core or not (it is otherwise mostly made of ices). Plus there is something very new (to us at least). I reported on this in one of my October blogs. It is a lens-shaped deposit of "bluish" "stuff" along the equator of Mimas' leading (forward-facing) hemisphere. This material appears to coat the cratered surface. We now have an explanation for this feature, and a similar one on Tethys. Unfortunately I can't tell you the exact answer right now, as this paper has been submitted for review and we should wait until it is approved. I will post all the details on this phenomenon in a few weeks!So what did Cassini see in this rare close look? Cassini was moving so fast during the flyby (that's what happens during periapsis) that the number of images was somewhat limited compared to similarly close encounters of other moons, but the details were pretty cool. The first thing I do when I sit down to look at a set of Cassini encounter images is to just lay them all out like cards on a table to see how they all fit together. I also rotate them all to put north up, which makes it easier to get oriented as I try to match features to Mimas' map. 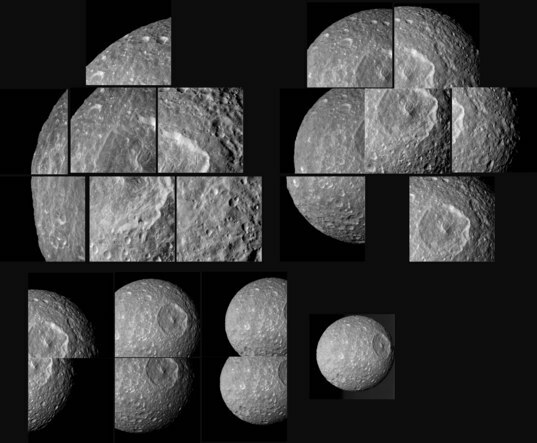 In this effort I was greatly helped by Jason Perry's Looking Ahead article, which explained how the images were organized: there were two seven-frame mosaics of Mimas' disk, one six-frame "ride-along" observation where the camera scanned Mimas disk, and a final multispectral view of Mimas filling one frame (a color version of which is at the top of this post). On February 13, 2010, Cassini flew within 9,500 kilometers of Mimas, the closest encounter yet with the smallest of Saturn's round satellites. Cassini approached from the night side and retreated with a nearly full-phase view of Mimas' leading hemisphere including the giant crater Herschel. The highest resolution view (the bottom center frame of the first mosaic) shows Herschel from a distance of about 15,000 kilometers away. Two multispectral mosaics covered most of the visible disk around the crater Herschel. A few last images were caught as the camera "rode along" with an observation by one of the other optical instruments, and a last full-globe, multispectral shot of Mimas caught it completely filling the frame with the limb of Saturn as a backdrop. One of the notable things about this view is the relative lack of craters within Herschel and on the striated ejecta radial to Herschel. 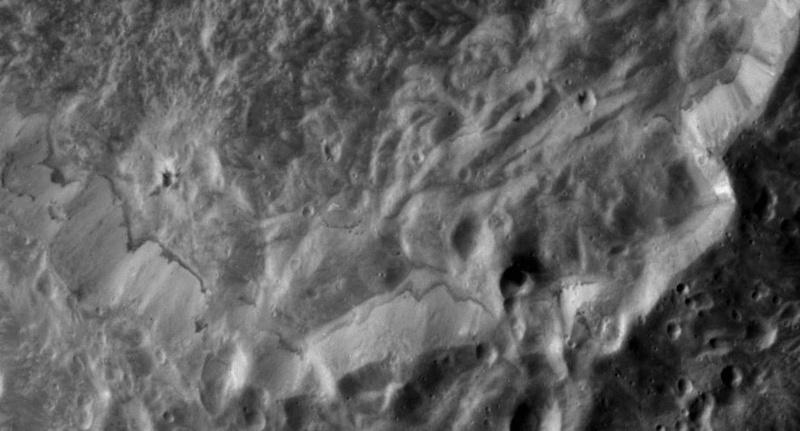 Since surfaces accumulate craters as they age, lack of craters implies a relatively young age. We knew this about Herschel before, but it's still kind of neat to see it confirmed in detail. Across the solar system, there are lots of places that have giant craters, but usually those giant craters are very old; they've been modified a great deal by later impacts. Studying Herschel up close should provide a clearer view of what happens to an icy moon when something big hits it. My first instinct when I see a stripe in a crater wall is "layers." But I think it's pretty clear that this stripe is not evidence for internal layering within Mimas. It doesn't follow topography the way that it would do if it were a horizontal layer cut into by the impact crater. Instead, it looks for all the world like the edge of a spill or splash, like the line left on a beach after waves have washed up it. It has that kind of lobate shape. This is a big impact crater into an icy moon; could this dark line have something to do with impact melt? I don't know -- that's just my wild guess. Also, I wonder if that's a relatively fresh crater near the left side of the detail image, the dark- and bright-rayed splotch. Nearly six years into its mission, Cassini continues to deliver cool pictures!